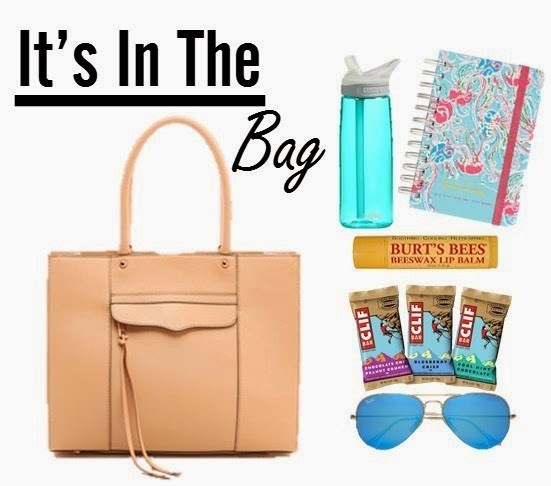 My favorite post are for sure this months favorites and of course what is in my bag post. It is so fun to see what people have to carry around from day to day to keep them sane. Here is what I tote around. |The Bag| This is hands down my favorite tote bag to date. I love the color, it is just dark enough not to show dirt. It is also big enough to fit my laptop, but small enough for day to day wear. |Water Bottle| Between workouts and chugging coffee I am always dehydrated. I would honestly die without a water bottle. Plus this water bottle comes in so many colors its fun to carry around. |Planner| I am already the most disorganized person on the planet, so this is why I need to have dates in order. This planner is so helpful and there are so many views to look at to be as organized as possible. |Chapstick| I think this goes back to the whole coffee and being dehydrated thing. My lips are always chapped and this really helps out. |Snacks| Honestly the only thing that motivates me for anything is if I allow myself to snack while I am there. Plus, cliff bars are my favorite snacks so I always carry a couple where ever I go. |Sun Glasses| These are just a must, whenever the Michigan sun does come out it is blinding to out sensitive eyes that never see it. Plus I love the blue color, they make a statement but still act like a neutral.